AB402, Merovingians, Uncertain. Time of Clovis I-Clotaire I. Ca. 491-560. AV Tremissis (1.45g) Very Rare! AB402, Merovingians, Uncertain. Time of Clovis I-Clotaire I. Ca. 491-560. 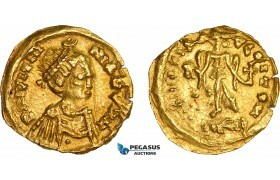 AV Tremissis (1.45g) (pseu..
AB597, Merovingians, Uncertain, in the name of Justinian I (AD 527-565) AV Tremissis (1.27g), ..
Z20, Merovingian, Mummolus (ap. 620-640 AD) AV Tremissis (1.25g) Cabillonum ( Chalon-sur-Saône ) Rare! 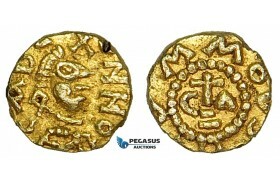 Z20, Merovingian, Mummolus (ap. 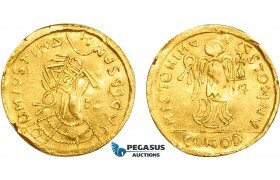 620-640 AD) AV Tremissis (1.25g) Cabillonum ( Chalon-sur-Saône..